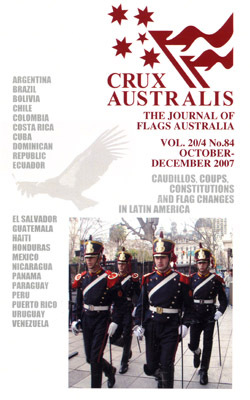 Following is part 4 of the complete listing of all issues of Crux Australis including all the major articles. Minor "notes" and illustrations without text are not included. 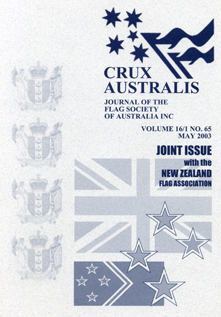 Issue 4 of each volume includes a full index of all flags and topics contained within individual articles. Articles which do not have an identified author are credited to the editor at the time. Pages are numbered sequentially by volume. 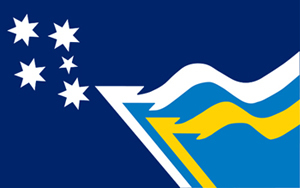 The Best Flag We Can Do - Or a Change in the Wind? Onward Xn Soldiers: Australians Future? A New Flag: Proposed New Design: "Stylised Silver Fern"
More than a Student Caper?